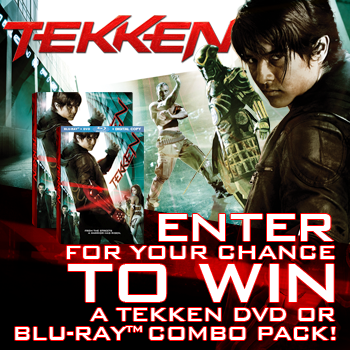 Tekken DVD & Blu-Ray Combo Pack Giveaway Now Live! The fast action of Tekken leaps to live action! Thanks to Anchor Bay, we are giving members of The Escapist a chance to win one of five copies of the movie on DVD & Blu-RayTM Combo Pack. To find out how to enter for your chance to win, head over to the contest page by clicking here. In order to participate, you must be at least 18 years of age and a resident of the US. Based on Tekken the videogame - Rising from the ashes of a crumbled civilization, gladiatorial combat has replaced warfare and ruthless fighters pit themselves against one another in a bid for global supremacy. The year is 2039. World wars have destroyed everything and territories are run by corporations. The mightiest of which is TEKKEN. In the midst of the ruined society, one warrior rises from the streets. A young man with raw fighting skills who is driven by vengeance for the murder of his mother. To exact his revenge he must defeat the world's elite fighters in the greatest tournament ever known. Don't want to wait or know a friend who would enjoy this right now? Feel free to order it by clicking here and get it shipped anywhere you choose!